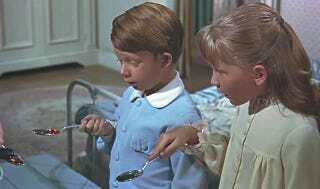 Remember being enchanted as a kid when Mary Poppins poured out medicine of different colors from the same bottle? This video from MIT lets you pull the same "magic trick"! Only instead of medicine, it's bleach. So seeing this video brought a warm flush of nostalgia, plus tingle I get whenever the potential for evil rears its head. To be fair, you can probably pull this off with just lemon or lime juice and some sugar to dust the bottom of the glass. But they break out the glass-cleaner and bleach. I'm not saying Mary Poppins should have used this trick to knock off Jane and Michael, but I think we all could have used a little less Bert by the end of the film.